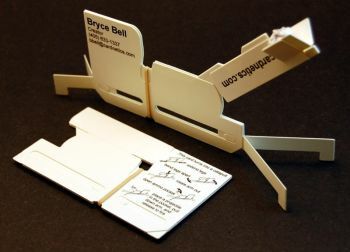 The original Cardapult is the size of a standard business card when closed (3.5" by 2"), but opens to form a functioning desktop catapult. This rubber band powered catapult can fire wads of paper or any other small objects that you may have around your desk. Legs at the bottom of the card allow the card to stand upright. Watch the video embedded below to see the Cardapult in action. The axles on this version of the card can be split apart accidentally by someone trying to pull the card apart a little and peek inside. Version 2 of this card has larger axles to make it less susceptible to this problem.